Q1. Where are you from? Which often leads to Longer Answer1: “We are originally from Massachusetts, the Boston area, having lived there for 23 years (gesture toward me) and 30 years (toward Mitch), respectively. But in the summer of 2014, we sold our homes, four cars, a lifetime of belongings, put a lot of stuff in storage, bought an RV, and dropped off our two youngest sons at their respective colleges in South Carolina and Utah. Q2: You have two kids in college?? A2: Yes, thanks. 🙂 Actually, three. He has two boys, I have one. The oldest one is a junior at Virginia Tech in Blacksburg, VA.
Q3: Where in SC is Valerie’s son going? A4: Clemson University in Clemson, SC. Q5: Utah?? Why did Mitch’s son decide to go to University of Utah? A5: Because of all the awesome snowboarding nearby. And the engineering program. Q6: Why did Mitch pick South Dakota as his domicile? 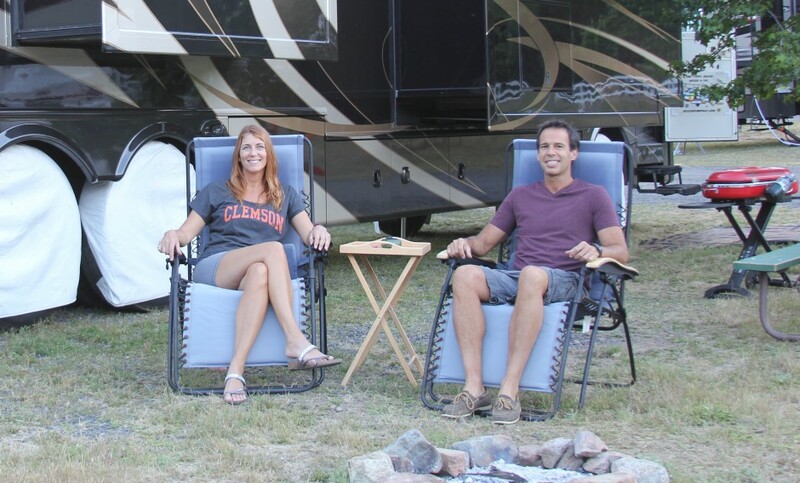 A6: When you live in a traveling motorhome, you can pick any state as your permanent residence. South Dakota is one of the top three states for full-time RVers to pick as their domiciles (TX and FL are the other two, by far). South Dakota makes it very easy to get residency (you have to spend one night there every five years). We plan to spend many more than that–it’s a beautiful state! And you have to own property, which can take the form of a permanent mailbox. The state has many companies that offer services to help you get your domicile and take care of your mail. South Dakota also has no income tax and low sales tax. Val kept her Massachusetts residency because the cost of health insurance for herself and her son is low enough to justify paying state income tax on her income. We looked into picking the states where our kids go to college, but either their residency requirements were too restrictive or not advantageous enough. Q7: So what’s your itinerary? A7: Well, we have a lot of places planned…we are criss-crossing the country about five times in 12 months. The trip really started after we settled Mitch’s college freshman son in Salt Lake City in late August. First we went to visit a friend in Park City, Utah, then we spent a week at Lake Tahoe for Labor day weekend, then to Val’s hometown in Reno, then to Vegas to visit Val’s sister, then the Grand Canyon and Sedona and Phoenix…how much time do you have? We’ll be in the Southeast (FL, GA, SC, NC) for much of the winter, then crossing the south to New Orleans (Mardis Gras? ), attend the South-by-Southwest (SXSW) music festival in Austin in March, and the Coachella Music Fest in Palm Springs, CA in April. We’ll head north through California to Washington state through summer 2015, then across the north to visit Val’s family in Iowa and New Hampshire. Then we might just go another year, because a year just isn’t enough time to really enjoy the entire country! Burning Man is high on our list, but when we go, we will rent an RV because the dust and dirt are legendary. We don’t plan to ever spend another winter in the north. Q8: Where will your kids go when they’re on vacation from school? A8: They will just join us wherever we are; so we will be in Florida for Thanksgiving with Mitch’s parents so his kids will fly to join us there. My son may fly home to MA to be with his dad or possibly spend Thanksgiving with my parents in Aiken, SC (two hours from Clemson). We plan to pick up the East Coasters after their finals in December and drive to join the Utah kid and do some snowboarding/skiing. Then we’ll drive to Vegas to spend the holidays with Val’s family. Then the kids will either go home to visit the other parents or back to their college towns, as they wish. A9: Yes, yes, I do! I intended to drive it from the beginning so that Mitch wouldn’t have to do all the driving, almost 30K miles in all over the first year. It’s intimidating at first, and a little exhilarating, and sometimes scary. We had to be very brave at first, but you get used to it. Driving at night is absolutely HORRIBLE because you can’t see anything in the rear-view mirrors or cameras to change lanes or park. It’s a lot like driving a truck. It’s about 60′ long when the towed car is in place. Q10: How are you managing such a trip for a year? What do you do for work? A10: We both are still working, part to full time, depending on the season. Mitch is a business consultant and partner at a venture capital firm based in Ohio; Val is a science and technology writer for trade journals, mostly. We are both self-employed. Mitch has been self-employed since 2002, Valerie since 2006. We can work anywhere we have internet and phone. We have a Pantech Millenicom (Verizon as of Nov. 2014) mobile hot spot that enables us to have internet everywhere that Verizon has cell phone service (which means we do lose signal in remote parts of the west, which we have to work around). Living in the RV is actually cheaper than when we lived in Massachusetts. Q11: How do you get your mail? A11: We have almost everything converted to electronic billing or email notices. We do our bill paying and banking all online. For the few things that fall through the cracks, we use mail notification services in our home states that provide us with permanent addresses. When the services get a piece of mail, they email us about it and can either discard it, scan it, or forward it to our next known destination (for a price). It has been tricky so far and a bit pricey. But it’s worth it! We don’t even know what we’ve missed! Mail!? Who needs it? HA! Hope that answers most of your questions! Do you have any other burning questions I’ve left off the list? 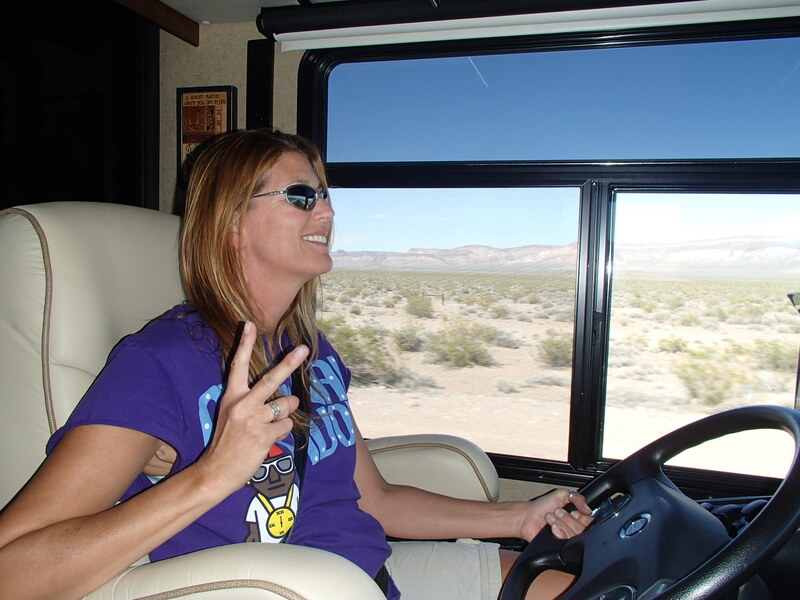 Follow more in my next blog post We did what they say never to do: buy a new RV. Feel like you’re missing some of our blog? You may be, so start from the beginning or at our “About Us” page and make sure. WOW….A scary decision….selling everything and storing a little … How were ever able to make that decision? I would love to do what you are doing, but just the thought of selling everything is what is holding us back. I know, right? We actually stored everything we intend to keep for our next house in who-knows-where (southwest U.S.). That made it easier to sort through stuff to keep and stuff to sell. It costs something every month we store our precious belongings in environmentally controlled storage. But that makes it easier to make the leap.